A brief explanation of the difference writing assignments and submissions, and when you can add them to your class. What is the difference between a writing assignment and a submission? Writing assignments are likely to be a large part of your Wet Ink class. You post these to everyone in the class to complete. You can require that students provide feedback through critiques or they can provide less formal feedback through in-line comments and discussion. Assignments can be required or optional. With submissions, you can create a schedule with staggered dates for individual students to submit their writing. This is typically used in classes/workshops where students take turn posting their work in the class for others to critique on. Note about critiques: Critiques settings for submissions and writing assignment can be adjusted separately. That means you can require all students to critique submissions, but ask that assignments only receive critiques from a few students. What is in a writing assignment (not an annotation assignment) or a submission? A brief title of your assignment or submission. The detailed text of your assignment or submission. There may also be images, videos, or audio. 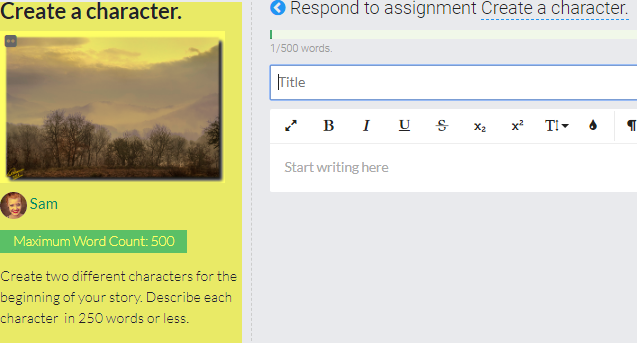 Suggested word count for the assignment. Wet Ink does not enforce the word count. However, it visually shows you that you have exceeded the word count. These details are included on the 'Assignments' or 'Submissions' tabs, but are also on the left side when students are completing an assignment or submission response.